Hindu Mythology is so huge and all-encompassing that one article will never be enough to list its teachings. We are guided by certain moral values and principles. The source of such values and principles can be many things. But many of us derive these values from certain characters we have read or heard about. The Hindu Mythology has a plethora of such characters. We have a whole world of Epics namely Ramayana and the Mahabharata. Both these epics are worth reading/watching and more importantly sharply studies. Because everything we know today as Hindu mythology is a door to immense knowledge and wisdom. Rama leaving for exile along with his wife Seeta and his brother Laxman. The Epic- Ramayana teaches us the importance of promises and commitments more than anything else. Dashrath, the king of Ayodhya had granted Kaikeyi, the queen, two boons when she saved his life in a battle. Kaikeyi demanded her 2 boons promised to her by Dashrath on the day when his eldest son Rama was to be crowned the King of Ayodhya. Her first demand was that Ram should be sent for an exile of 14 years to the forest and the second, that her son, Bharat, be crowned King instead. When Dashrath wasn’t sure to uphold such heartbreaking demands, his son Rama reminded him that honoring one’s word is the highest duty and gladly left Ayodhya to keep his father’s word. This is a story that teaches us how significant a commitment or a promise you make is. 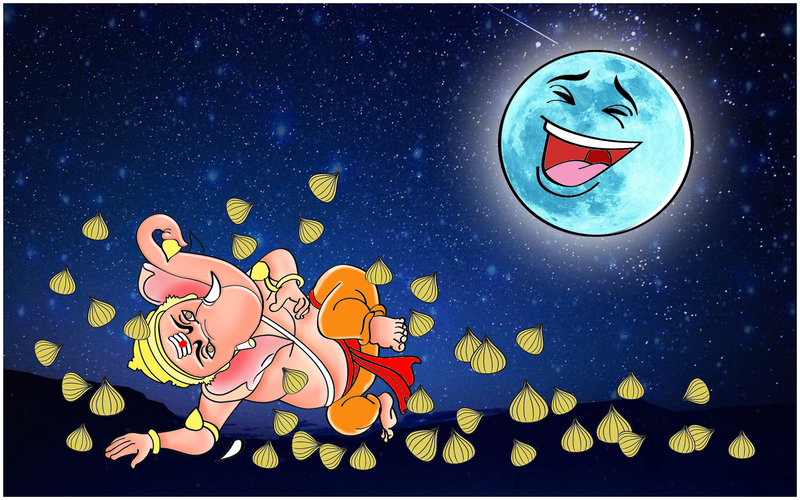 Ganesha lost his balance and fell off as the Moon burst into a cynical laughter. There’s a story of Lord Ganesha and the moon. In the story, Lord Ganesha was returning after having a hearty meal and on his way he stumbled and rolled over his belly. The moon saw it and mocked Lord Ganesha’s famous pot-belly. The Moon’s mockery and laughter angered Lord Ganesha and compelled him to curse him. Lord Ganesha cursed the moon to disappear from the sky completely. The moon begged for forgiveness. Finally, Lord Ganesha decided to forgive the Moon and reduced his punishment of disappearance to just one day. We all must learn to be better than what our anger makes us and realize that forgiveness is the greatest virtue. The five brothers had to constantly struggle to get what was rightfully theirs. The story of Mahabharata revolves around a fight between the good and the evil. It is a fight of Pandavas trying to attain what rightfully belonged to them. As we go ahead in the story we see that the Pandavas go through great many miseries but they never stopped fighting. They always gathered the courage to keep fighting for what’s theirs. Their determination is something we all should learn a thing or two from. Because at the end of it all, they won and got what they deserved! One of the Pandavas in Mahabharata, Arjun was a great learner. He was known for his constantly learning attitude. He grasped everything that he experienced in his life. He was such a prolific and desperate seeker of knowledge that he had several teachers in his lifetime. He learnt military science from Drona, he learnt about divine weapons from Indra, he learnt from the Mahadeva himself too. And during the battle, he sincerely learnt everything that Lord Krishna offered in the form of words and wisdom. This attitude of his to never stop learning, ultimately lead him to victory. To sum up all Hindu mythologies, we can say that there exists a larger plan of the Universe. Everything that is happening is happening for a reason. Every action has cause and effects. We must handle our troubles, problems, awards, everything with utmost sense and care. We must always stay optimistic and keep doing our ‘karma’. The vast and never ending knowledge of Mythologies have a lot to offer to our world today, if only we decide to indulge!